This Amy Lepard, wife of U.S. Ryder Cupper Chad Campbell. Amy is a singer. Her Web site includes, in addition to more photos, information about performance dates and recordings. Update: We've posted several more photos of Amy. See here, here and here. When last I looked at the leaderboard, this lovely lass was leading the ladies' loop (second round at the Safeway Classic). She's Jenna Daniels, who we've featured before here. This stylishly attractive young lass is Brandi Jackson. While in college at Furman University, Brandi was named All-America in 2003. She played the LPGA Tour in 2004, and currently plays the Futures Tour. In 14 events so far this year, she has made the cut 13 times with three Tops 10s and a high finish of second place. 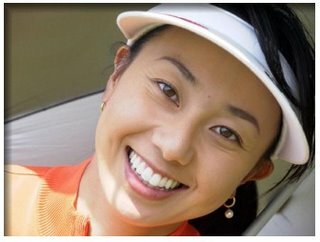 This lovely is Riko Higashio who plays on the Japan LPGA Tour. Too bad she doesn't spend more time in America.